My blogging will continue to be intermittent now that our October production approaches. We’ll be headed up north to Ithaca for rehearsals in September. Before we leave we will host one more Avant Yarde event, so stay tuned here for that announcement shortly. 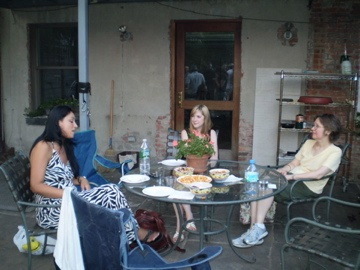 Markus drove Carolina to JFK Monday night, so she is back in Argentina now. She is gone and present at the same time. I am meditating on her performance with Markus in She and the Empty Living Room. How do such performances function in the relationships we build over the years with friends and peers? Life and art entwined into the same tapestry. The experience of “the other” is the most absolute knowledge we are allowed in our lives. Theatre and art can act as conduit to that experience but their rituals often function best as extensions of our everyday ceremonies. An exploration of (anti)communication, disobedient tongues, a missing left foot, a dance, a relationship, a poem, or a broken heart. 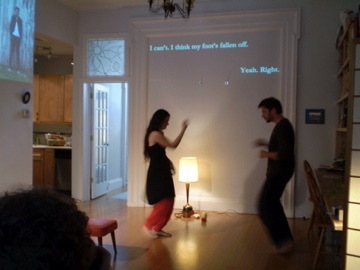 She and the Empty Living Room is a play in translation (literally) about the act of translation, repression/oppression, and the language in your head that turns you into someone else. 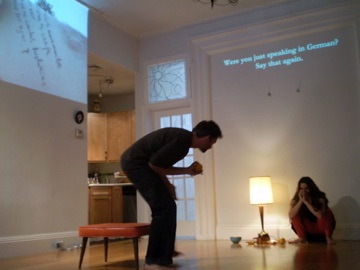 She, and the Empty Living Room is a chamber play that looks at the (de)evolution of a relationship and the language it inherits. In loosing your language by trying to replace it with another you loose yourself and appropriate the other. Pretending to be someone else until you are forced to be the person you didn’t know you were. 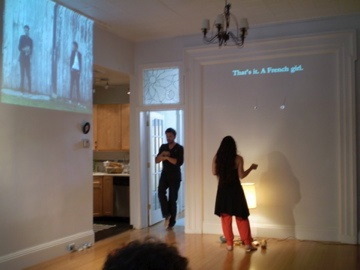 It is a play performed live by two actors in Spanish and English with simultaneous translation delivered via subtitles across two monitors on which also a film is seen. It is this film that is inherently translating the image (the play) before your eyes. It takes place in an almost empty room. A room in a house that is lived in. 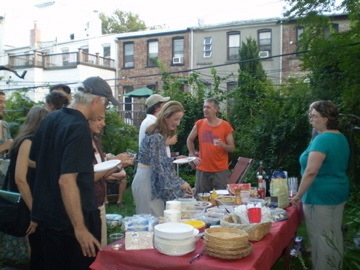 Afterwards the public is invited to stay. There is a salon of sorts, hopefully on a divan with red wine and banana bread. This interaction is the end of the event and just as important as the event itself. What brings you up to Ithaca? Are you going to have any performances here, or just rehearsals? You’re in Ithaca? Cool. Where’s that waterfall? It will be hard to concentrate on rehearsals with that kind of outdoors as temptation. We’re rehearsing in a private garage so we can install and interact with the set there. If you’re interested, we might open up some of the rehearsals or run-throughs. Either way, we can meet up if you’d like. That particular waterfall is on Lake Street, right near Ithaca High School, but there are a ton of them around here – “Ithaca is Gorges,” as they say. Keep me posted if you guys are interested in opening up rehearsals, that would be cool. Give me a shout when you’re in town. What an interesting use of space and mixed media! 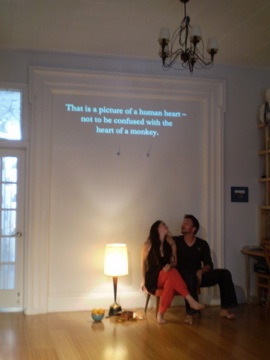 The play’s location undoubtedly provided a sense of immediacy. I’m a few years late, but thanks for letting the world know!